Kids + Pears = A Pear-fect Match! Fresh pears are a healthy addition to your school lunch menu. 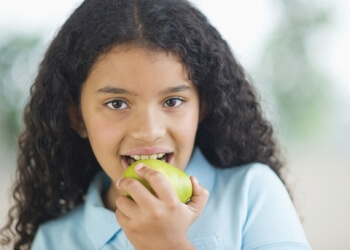 While the nutritional qualities of fresh pears will please you, their sweet and juicy flavor will win over the kids! Introducing children to the delicious taste of fresh pears helps encourage healthy eating habits that will last a lifetime. Beyond the Anjou and Bosc pears available to you through the USDA’s school lunch purchases, there are several fresh pear varieties that can easily be incorporated into your menu throughout the year. Bartletts are harvested in August and are an excellent menu item through December. Anjou pears, harvested in early fall in the Northwest, remain available nearly year-round, and can stay on breakfast and lunch menus throughout the school year. The Bosc pear is a perfect choice for baking, or serving fresh with nut butters, yogurt, or cubed cheese. Tiny, sweet Seckels served whole make a healthy tray snack, just the right size for your youngest students. Visit our foodservice site for kid approved recipes, including a Pear and Pumpkin Snack Cake and Pear and Grilled Cheese Sandwiches. These recipes have been developed using other commodity foods to make your meal planning easier and healthier! Be sure to serve USA Pears fully ripe, when they are at their maximum level of sweetness and hold the most juice. You can ask your distributor to ripen them for you, so that your USA Pear deliveries are ready for immediate use. Most pears, except Bartletts, don’t change color as they ripen. Check the Neck for Ripeness at the stem end, using slight pressure with your thumb. Pears are ripe and ready to eat when they yield to gentle pressure. Our school foodservice materials will help you have a successful experience with fresh pears on the lunch menu. For additional information, please email us. To order USA Pears, contact your produce supplier.